Ou Chay Village, Siem Pang District, Stung Treng Province. after they were evacuated from their village. Stung Treng province, Cambodia, August 2018: As children run along the mud roads of Ou Chay village in Santepheap commune, which lies along the Sekong river, the squeals and shrieks from their game of catch-me-if-you-can is the only sound that breaks the silence of the sleepy serenity of the village. The apparent tranquillity in this community, located in Stung Treng province in north-eastern Cambodia, is a far cry from the previous week’s events when news reached the village of the collapse of “Saddle Dam D”, 283 kilometres away in the neighbouring Lao People’s Democratic Republic (PDR). The breached dam was one of five auxiliary dams of the Xe-Pian Xe -Nam Noy Hydropower project in the Attapue Province of Lao PDR. Cambodian authorities, including the provincial government, coordinated with Non-Governmental Organizations (NGOs) and UN agencies on an emergency response. They worked together to alert communities of the threats of the rising river levels worsened by the breached dam, and to provide families with the support and information they needed to stay safe. In Stung Treng, over 5,500 families were affected by the floods and about 1,355 of them were evacuated to higher ground when the water levels rose above the alert level of 11.5m . An emergency evacuation plan was activated by the Commune Chief in Ou Chay to alert villagers to the impending flood. Local shopkeeper and rice farmer, Sok Vi (31) and her husband, Hiv Den (41) a mechanic, could see the river encroaching towards their home as it rose. Sok Vi grabbed her two boys, Dan Suka, (10) and Dan Mikra, (5) and piled them into the truck that had been arranged by the provincial government to evacuate her neighbourhood. Hiv Den stayed behind to tend to their livestock. Within an hour, he joined them at the emergency meeting point where hundreds of others had gathered. With dark clouds looming and no food or shelter at the safe ground, Sok Vi was grateful for the packs of instant noodles and tents that were distributed by the emergency responders. Sok Vi explained that she is familiar with the threat of floods. The Sekong River passes through Stung Treng Province where she has lived all her life. 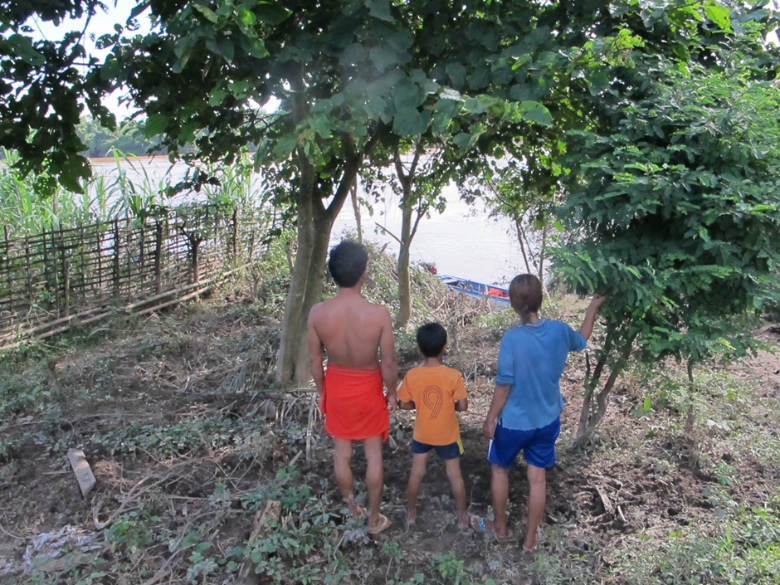 For Sok Vi, floods are the norm during the monsoon season. But this time, the floods came three months early. ‘I’m usually prepared for floods during monsoon season. I would have food packed and ready to go if floods happen. But this time, we were not prepared,” she said. Water, sanitation and hygiene (WASH) products procured by UNICEF were provided to the Royal Government of Cambodia earlier in the year, to help the government prepare for and respond to emergencies such as this. Sachets of water purification powder, buckets and soap were given to families to prevent waterborne diseases like diarrhoea. Mosquito nets and sleeping mats were also distributed. ‘Before the floods, I would never have believed that water from the river could ever be made clean this way [with water purification powder]. Now we can clean the water to drink.’ said Hiv Den after a demonstration by Mr Sopharo Oum, WASH Officer, UNICEF Cambodia, of how to use the donated products. Families were able to return to their homes a few days after evacuation, when the flood receded, but the work of local authorities was not yet over. The Commune Chief met with provincial authorities and representatives of organizations supporting the emergency response to discuss the needs of the villages and steps to take to ensure their continued safety, especially of children, and to improve future emergency response. Feedback was collected from families supported during the flood. According to the preliminary findings of the assessment, providing families with vital information is top on the list of things to do. “When families are given WASH products, like the water purification powder, especially in an emergency situation, it’s important to inform them, and if possible, show them how to use it. 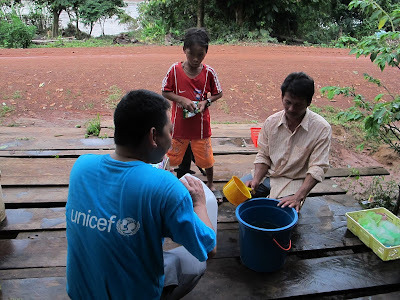 Then they can take extra precaution to make sure the water is safe to drink,” said Mr Sopharo Oum, UNICEF Cambodia WASH Officer. The assessment also reveals a need for better sanitation services in the communities as well as the information on how to use them. For instance, temporary latrines were installed at the safe area where families were evacuated, without information about the importance of using them, families continued to defecate in the open. In flood-prone areas, this adds to health risks when water sources are contaminated by human waste. These pressing needs are not unique to Ou Chay village. In rural Cambodia, one in two people practice open defecation, and three in ten people do not use an improved water source all year around. Access to improved sanitation and water facilities is essential for children and their families. in a demonstration by Sopharo Oum, WASH Officer, UNICEF Cambodia. Soky Vi offers her oldest son purified drinking water in their home. UNICEF is supporting the Royal Government of Cambodia to address such longer-term WASH challenges, by supporting the provision of services and promoting behaviour change in communities to help children grow up in a healthy environment and to help build more resilient communities. standing on the banks of the Sekong River after the flood receded.